11 years ago, today, I gave birth for the first time. My daughter, Madison, was and is a ray of light. 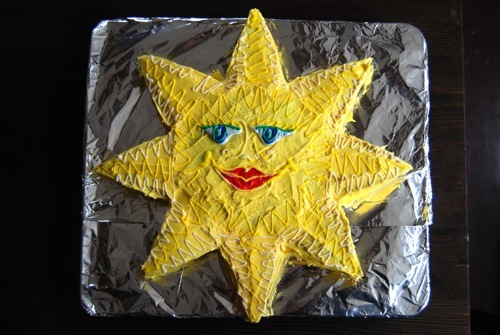 Positive, joyful and full of energy, we nicknamed her ‘Sunshine.’ This cake is my homemade present to her. I used my recipe for the Best Low Sodium Birthday Cake Ever, swapping lemon extract for the vanilla in the cake batter, and adding yellow food coloring to the frosting. 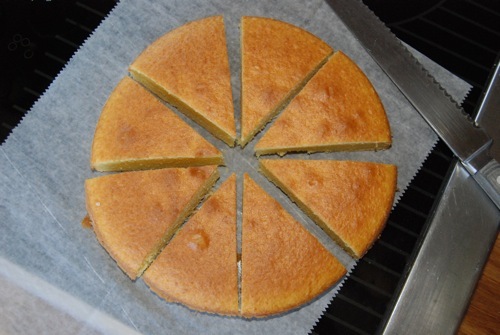 Bake the cake in two 8-inch round pans, leaving one intact and cutting the second into 8 equal wedges, as show below. 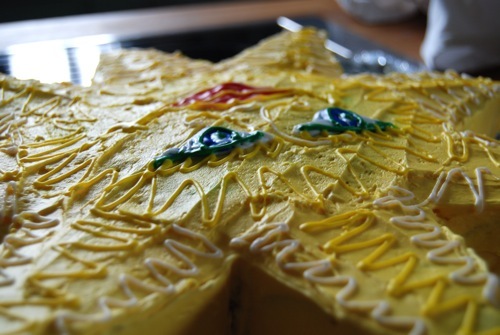 Once assembled, the yellow-tinted frosting gives the cake its sunshiny look and can be decorated whatever way you’d like. For Maddie’s cake I piped on multicolored icing to make a face, but you could use M&Ms or other candies, colored sprinkles or sugar. The beauty of this cake isn’t just in its looks either. As delicious as it is pretty, it’s sure to put the sunshine into any celebration. 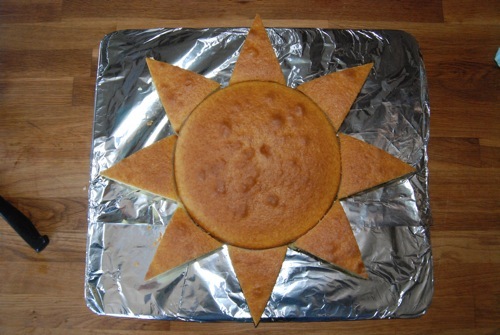 Many thanks to the cookbook Baking: easy-to-make home bakes for the sun cake inspiration. Preheat oven to 350 degrees. Get out two 8-inch round cake pans. Grease and flour both pans and set aside. 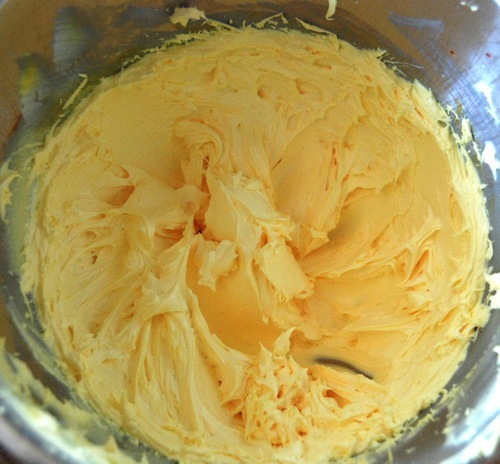 Using a mixer, cream the sugar and butter in a large bowl. Add the eggs and lemon extract and blend well. Sift together the flour and baking powder in another bowl. Add the flour mixture to the wet batter, about 1/3 at a time, alternating with the milk. Repeat until everything has been added, mixing well. Leave the one round cake whole and position it in the center of the baking sheet. 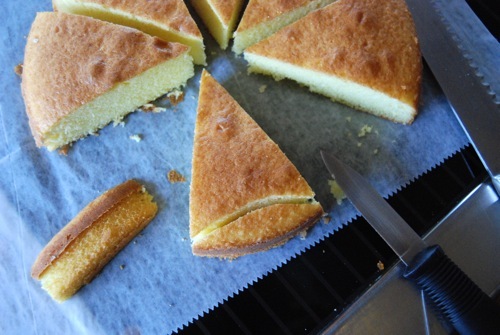 Using a very sharp knife, cut the second round cake into 8 equal wedges as shown. Trim each wedge at the base, so that it fits snugly against the round cake. 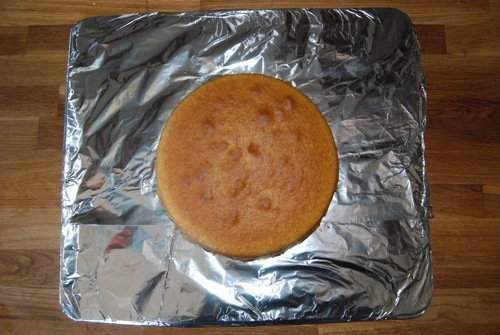 Assemble the sun by placing the trimmed wedges around the round cake as shown. 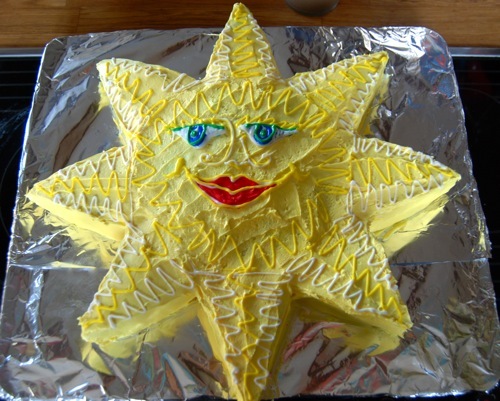 Set the sun aside and prepare the frosting. Sift the powdered sugar into a large bowl. Add the butter, and cream together using an electric mixer. Add the milk and vanilla, and beat until smooth. To tint the frosting, add yellow food coloring, one drop at a time, beating and adding more as necessary ( I used 24 drops for the color shown). Spread a tiny dollop of frosting on the base of each wedge to “glue” it to the round center. Then gently frost the top and sides of cake, and decorate as desired. HAPPY BIRTHDAY TO MY SUNSHINE!!! This entry was posted in Dessert and tagged Happy Birthday Madison!. Bookmark the permalink. my wife would love this too… she’s ‘all about celestial stuff’! Thanks Inky! Now you know what to make her for HER birthday!! So cute! And of course I immediately pictured you baking a really huge cake and then cutting chunks out to make the rays and feeding the extras to the dog. This is much smarter, and I’m apparently very uncreative. Its my b-day!!!! I am hungry now…. Such a cute cake! I bet your daughter was thrilled. I envy you. I don’t do desserts very well at all. Beautiful!! Happy Birthday, Ms. Maddie! Sorry Maddie, your comment got stuck in the spam file! Glad you finally got to eat your cake. It was so yummy!! Happy Birthday, SUNSHINE!! We love you! such a cute cake!!! i’m sure maddie girl loved it. sending her belated wishes for a wonderful 11th year. this cake really looks delish but i’m scared of her bday dinner choice. fish? really? for an 11 year old? where are the chicken nuggets? your kids have more sophisticated palates than me!